Use code SHEREENTRAVELS20% to save 20% off any Travelon purchase. 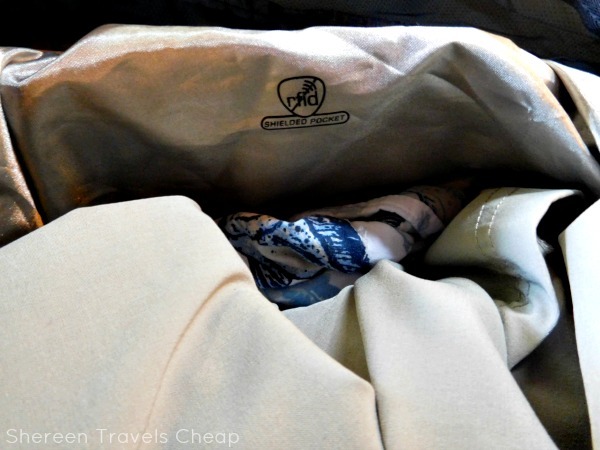 Do you tend to pack extra bags for your trips or get to your destination and dump out your personal-item size bag to use as a day bag? 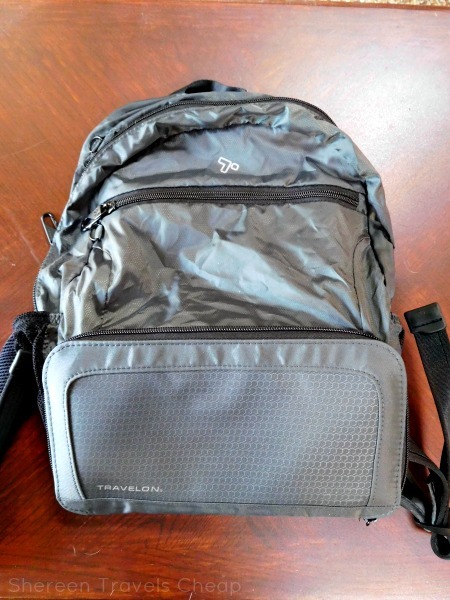 I'll admit, I've overpacked just trying to plan my trip around the city or my travel back home, but Travelon knows that people want bags that are functional for more than just one thing, so they created this anti-theft backpack, that is also packable, so you can bring it along without much fuss. Most backpacks are bulky, and the ones that aren't tend to be really flimsy and not suited to taking along to touristy destinations where you might be targeted by thieves. 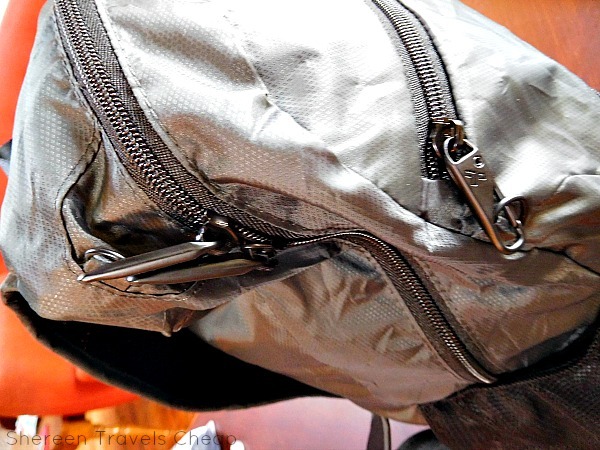 I saw this bag at the Travel Goods Show last year and knew it was a must for travelers, especially those who have children or like to go on day trips or just want an extra bag for purchases. 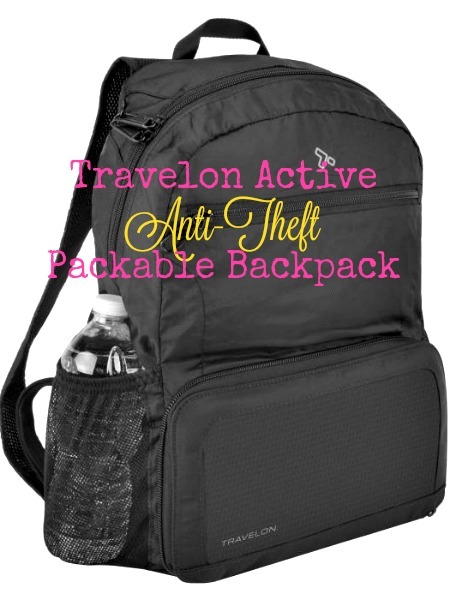 The Active Anti-theft Packable Backpack is compact, even when it's zipped into its pocket. The front and back is slash-proof, which will be instrumental when it is open. I had no issues restoring this backpack to full size or folding it back into its pocket, which is a big plus, because sometimes these bags are like trying to refold a map and you just give up. 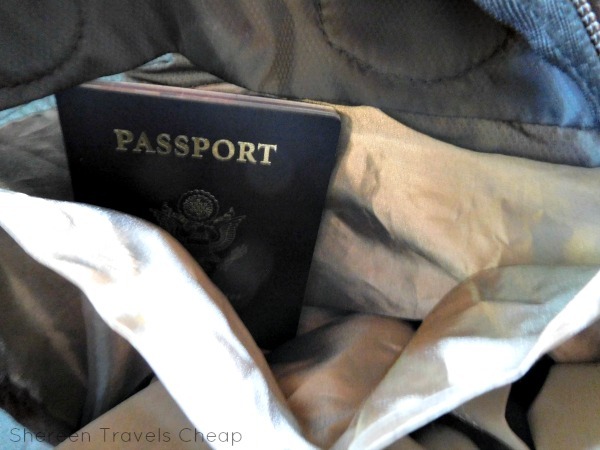 The structure of the pocket makes it easy to pack up to toss in your carry-on when you're done with it or before you leave home. Think you might need an extra bag when you're out and headed to the shops or the farmers' market? just pop it in your purse and you're good to go. In fact, I was able to get it into my Boho bag (review coming soon) without having to take anything out of it. I love that. Now, let's look at the backpack at full size. The front and bottom are made from the slash-proof pocket, which means you don't have to worry about thieves cutting the bottom of your bag to get your valuables to fall out. Your straps also have slash-resistant construction, giving you more peace of mind when walking around in crowded areas. As you'll see, because the front and back of the pocket make the front and bottom, your backpack has structure and a flat bottom. The fabric is also a bit reflective, so you'll be seen even when walking around at night. This backpack is simple and doesn't have a ton of pockets, though it has a lot of space for your stuff. You're not going to lose anything inside, because you forgot where you put it. Keep extra clothing inside, pack a picnic for lunch and a blanket to sit on, bring our suits and snacks to the beach. This has room for all of that, without being bulky, even when packed full. 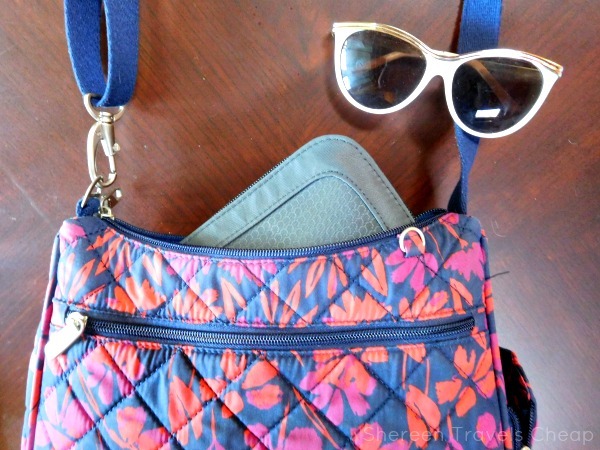 The front has a zipper pocket that's large enough for a tablet or a book, but you can use it for all those little odds and ends you pick up or for snacks that you know the kids are going to want the second you get on public transit. Inside, there is just one pocket, and it's RFID-blocking. This way if you have to carry around your passport or a spare credit card for emergencies, you won't be worried that your info is going to be stolen by electronic thieves. 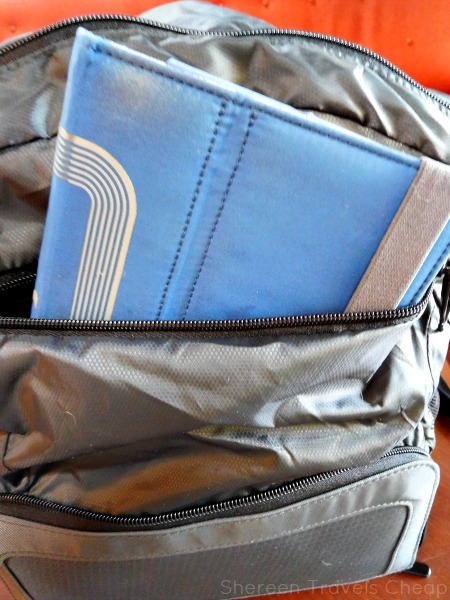 And because the pocket (which closes with a velcro tab) is along the back wall of the backpack, it's extra safe. 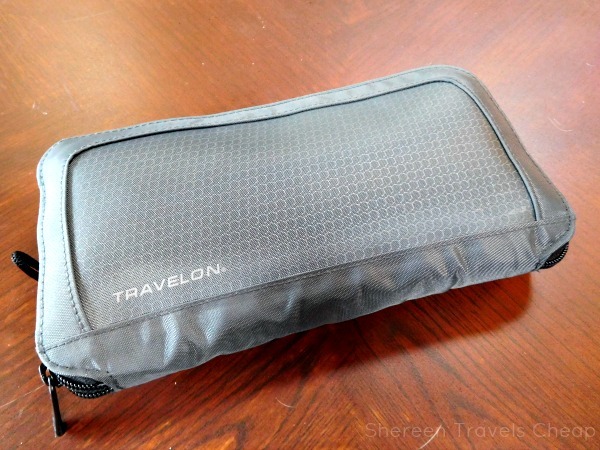 This security pocket is actually pretty deep, allowing you to keep a wallet in there, passports for the whole family, or whatever else you want to keep safe. Now, let's talk about the rest of the anti-theft features. Beyond RFID blocking and slash-resistant construction in the most important parts of the bag, you also have the ability to lock both zippers. The zips are like tiny caribiners and clip quickly and easily to tiny d-rings on the bag that are subtle and not immediately apparent to those who wish to steal your belongings. Nobody's going to be able to unzip your pack without you knowing if you use the clips to lock them in place. Again, this isn't a huge bag, but it is just big enough for all the things you need to take for the day or to carry around with purchases you've made along the way. It's lightweight and the perfect size for me, because even full, this isn't going to hurt my back or weigh me down. The straps are fully adjustable, so if you want it to fit snugger, it's easy to do that, even when you're on the go. If you're taller, just let the straps out. The straps are nicely padded as well, so they aren't going to cut into your shoulders. Even your kid might find this to be the ideal size for them to carry around all day. This bag has two mesh pockets on the sides. Use them for water bottles, an umbrella or whatever else you may need easy access to. I put my reusable bottle in one side and sunscreen in the other, because those are both things I'll use throughout the day. And now my hands are free to shop, ride a bike, play games in line at the theme park and so much more. 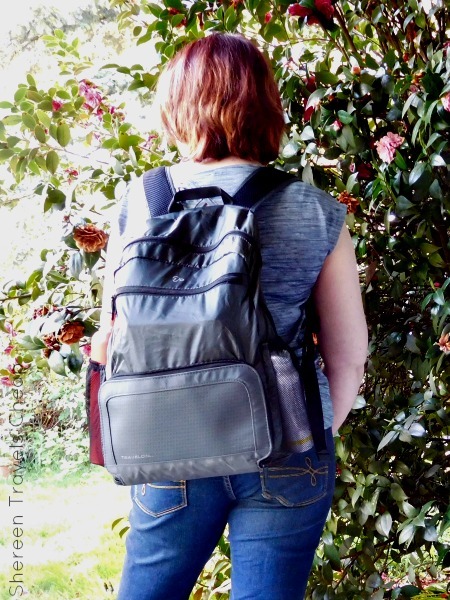 Disclaimer: I was provided with the Active Anti-Theft Packable Backpack for the purposes of this review, but all opinions are 100% my own.